The village of Arkholme lays on the B6254, some eight miles South of Kirkby Lonsdale. The Norman mottte at Arkholme sits, like Whittington, within the grounds of the 15th century church of St John the Baptist. It also sits right next to the river, which probably acted as a defensive barrier back in its heyday. Looking at a map, the motte at Arkholme lays about a mile and a half to the West of the motte at Melling...the occupiers of each castle may even have been able to communicate with each other across the Lune valley! The River has shifted to the West over the past, so it is now much closer to the motte at Arkholme, and much farther away from the motte at Melling. Above. A view of the motte looking South. Note how the motte is as tall as the church! 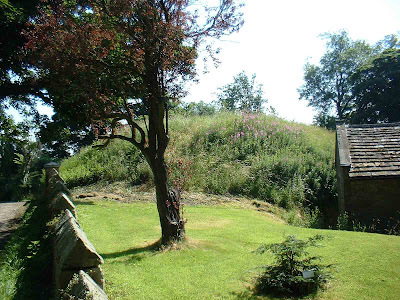 The motte is very well defined and in excellent condition. It stands around 6 metres tall and about 30 metres around its base. The bailey is no longer in evidence, although the footpath that runs the other side of the church yard wall, could well be running in the remains of the defensive ditch. Above. A veiw of the motte from the footpath that runs along the North side of the motte. The castle has been excavated, and there appears to have been two periods of building. 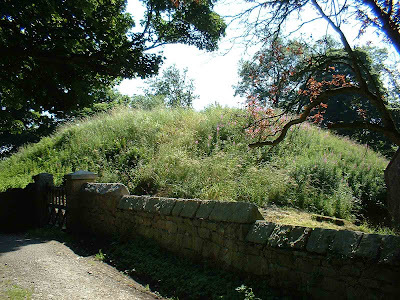 It is suggested that the original castle was some 2 and half metres smaller than the mound that survives today. This earlier phase of building, could well have been a Saxon moot hill (as at Whittington) with the larger Norman motte being built over the top, possibly to indicate to the local population that the Norman lords were here to stay. Above. 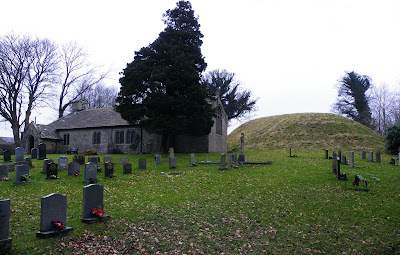 Another view of the motte at the West end of the churchyard. As at Whittington and Halton, Earl Tostig held the manor here at Arkholme. And, as at Whittington and Halton, after his death in 1066, the manor probably passed to Ivo de Taillbois, First Baron of Kendal. Above. The North edge of the motte. It's frustrating that there appears to be little information on these sites, when they were active, when they were abandoned, and what they were abandoned for. Above. A view of the motte from the footpath. The site is freely accessible, and the church itself is well worth a look, especially if you're able to get inside. PS They also lived in Chester, Pendle Hall, Halton, and Lancaster.